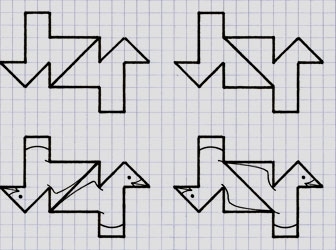 Another method of composing representational tessellations is that of what I term as subdivision of a tessellating tile. As such, the general principle here is to divide a given, geometrical tile in distinct parts, from which taken individually essentially do not resemble the original tile. Here, the original tile may not necessarily resemble a motif, but upon having so 'subdivided' then further possibilities thus become available in this aspect. Normally, but not necessarily, a tile that has rotation properties is selected, upon which when subdivided should remain of identical shaped tiles. For subdividing, the line ideally passes through the mid-point of the tile. Although it is possible to subdivide the tile in other ways, this invariably lessens the symmetry, along with adding additional tiles, with the latter as a rule not conducive to motifs. The process is first described and then illustrated abstractly i.e. without reference to motifs, as at this stage their introduction would be a distraction. Note at this stage I am establishing the principle - more convoluted 'devices' (in relative terms) suitable for motifs can be introduced subsequently. (a) Take a given tessellation tile, here of squares. 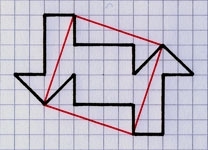 (b) Subdivide the tile by the introduction of a 'device', such as a single line or cross, both of which pass through the mid point of the tile. (c) Rotate the 'device unit' as according to the grid lines of the squared paper, until upon completion the unit will repeat itself. In this particular instance, each of the types has a 'cycle of four' before the resultant tiles would repeat themselves. As these are thus redundant, they are not shown. So, having thus established the principle, I now turn my attention to applying this to other tessellations and compose representational examples. 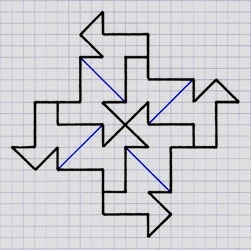 For illustrative purposes, a very 'simple' tile was selected (below), with a side consisting of a line which was then rotated four times around a square (in red) resulting in a tile possessing 180° rotational symmetry. The tile so formed is obviously not immediately suggestive of any type of creature, of which it may then be thought that this can then be dispensed with for representative purposes. However, all is not lost, as by the simple process of subdividing, a motif can indeed be found. As with the abstract example above, a series of outlines of the tile is drawn. 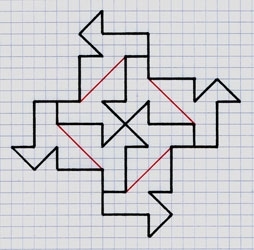 To these diagrams is then added (in red) a 180° rotational line that passes through the mid point of the tile. In contrast to the 'abstract' example, the indentations of the tile do not necessarily permit such a straightforward series of cycles. Here, an 'inner square' can be seen, which the line follows in a cyclical manner. As such, there are thus numerous ways in which to subdivide the tile, of which rather than proceeding in an ad hoc manner a degree of thoroughness is in order to ensure that 'all possibilities' are examined. Naturally, the first subdivision may not necessarily be the best. 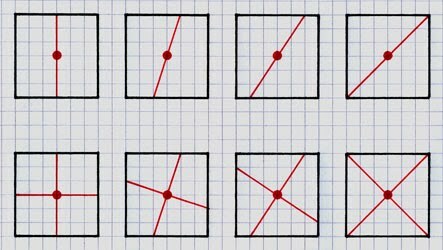 The diagram below shows systematic experiments in this, beginning with a straight line rotated about the mid-point of the tile. Further possibilities are tried, with the line progressing in increments using the grid lines. From this, with a modicum of imagination, the resulting tiles then immediately become more bird-like. Consequently, as 'all possibilities' are examined in a systematic manner, it is then possible to select the best one for a definitive drawing. In this particular instance, it should be obvious that Nos.3 and 5 are better than the others. So, having thus selected the best choice(s), to these can then be added bird motifs, as below. Admittedly, both birds are somewhat stylised, but even so remain worthy of bearing the appellation. Furthermore, although both are distinct, they are on a par with each other in terms of their inherent quality. All that now remains to do is to compose a finished, definitive tessellation, below. Another, additional aspect is that in this particular instance the original single tile can be seen to have two distinct bird motif interiors. Consequently, it is thus possible to combine these types, in a single composition, as below. Naturally, this adds to the inherent 'worthiness' of the tile, as innovations are thus shown.